Aims to describe why and how applied research carried out in a national public health program sometimes influenced program action in the field - and sometimes did not. This title presents and analyses a number of modified case studies to draw some practical lessons and to provide a theoretical basis for future program action. What Should We Know? The State of the Art of Research Utilization: A Commentary. Relevant Research Utilization Literature. Chapter 3. SETTING: "DON'T FORGET THIS IS A SMALL ISLAND"
Remember, Taiwan Is a Small Island. 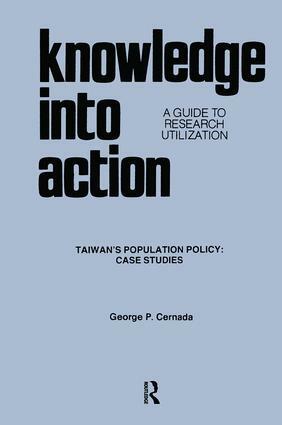 Factors Facilitating the Taiwan Family Planning Program (with J. F. Tsai). Population and Family Planning Profile. Research Was Not Utilized. Some Analysis of Favorable Factors. Dissemination of Results Internationally. Summary. Calendar of Events. Results. The Mysteriously Appearing Child. Commentary. Suggestions for Discussion. Summary. Background. Results. Commentary. Suggestions for Discussion. Summary. Tale of Three Townships. Results. Commentary. Suggestions for Discussion. Summary. Identifying the Need. Deciding to Do It and Getting the Money. Doing the Job. Interpreting the Research. Commentary. Suggestions for Discussion. Summary. Reasons Why the Project Began. Results. Commentary. Suggestions for Discussion. Summary. The Need for Action. The Campaign. Results. Commentary. Suggestions for Discussion. Summary. The Need for Action. Results. Commentary. Suggestions for Discussion. #8 SCIENTIFIC AMERICAN GOES ASIAN — George P. Cernada and T. H. Sun Summary. Determining Research Needs. The Classic Taichung Study. Use of the Results. Documentation and Dissemination. Commentary. Suggestions for Discussion. Case by Case. Cross-Case Analysis. Overview. Improving Practice. Toward a Stronger Theoretical Base. Summary of recommendations from East-West Communication Institute's Conference on "Making Population-Family Planning Research Useful: The Communicator's Contribution"
An internal memo to program administrators suggesting choices of mass media methods based on findings of three Island-wide sample surveys. A memo to the International Committee for Applied Research on Population (ICARP) to illustrate by Taiwan's experience, the possibilities for the use of mailing campaigns in Asian countries. Questions raised are answered. Description of innovative project to provide incentives to couples to space between children for three-year periods. Pilot project was implemented in Taiwan in 1975.